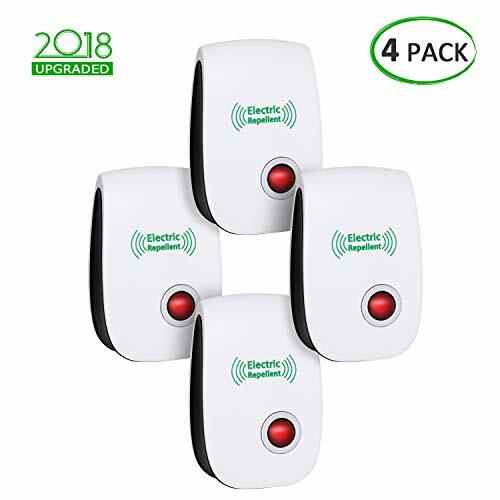 VEPOWER [2018 Upgraded] Ultrasonic Pest Repeller, Mosquito Repellent, Electronic Pest Control Plug in for Spider Ant Mice Roach and Other Insects (4 Packs) by VEPOWER at The Net Stores Network. Hurry! Limited time offer. Offer valid only while supplies last. Package Contents: 4packs About our Ultrasonic Pest Repeller: ✔The pest repeller with ABS material emits ultrasonic frequency of 22-65KHz. ✔The pest repeller with ABS material emits ultrasonic frequency of 22-65KHz. ✔Chemical-free, Odorless and Nontoxic; Safe for human and pets to use. ✔Efficient: Repels insects & rodents in 360°all-round deinsectization and it usually takes 2-3 weeks to notice the typical result. ✔This pest control can be plug in houses, warehouses, shops, hotels, hospitals, offices etc. 1. The installing point should be avoided to be in the back of the curtain, fridge, and any other furniture that deterring or attaching frequency. 2. Rodents and insects may increase in the first few days because they are attacked by specific frequency of ultrasonic, which is a normal phenomenon. And the ultrasonic pest repellent will drive them away completely about four weeks later. 3. Be sure to inform children in advance: The product is powered on when working. No playing! 4. Recommend：To increase the effect, you should install one insect repellent each room. Please be confident to buy our ultrasonic pest repeller as there is no risk for you to bear. We offer a warranty from the purchase for quality problems within 60 days. [2018 Ultrasonic Pest Technology]This Electronic Pest Repeller drives pests out of your home for Mice, rats, spiders, roaches, mosquitoes, ants, bed bugs, and other kinds of pests, which makes them even mice extremely uncomfortable. [Keep Environmental-Friendly and Safe]The bug repellent causes no harm to human or pets. Electrical Mosquito Repellent drives pests out without killing them, has no chemicals, non-toxic, no radiation. Definitely an eco-friendly pest reject. [Wide Coverage Area]The Insect & Rodent Repeller is effective with an unbelievable coverage area of 1200 sq. ft. It can be widely used in offices, warehouses, gardens, restaurants, hotels, etc. [Easy To Use]Just plug the Mosquito control in the electrical outlet then the red light will on. This Ultrasonic pest reject can effectively eliminate and drive away pests immediately without any mess. [Guarantee Assurance]If you are not satisfied with our pest ultrasonic repeller in any reason, feel free to contact us, we'll gladly make a replacement or refund within 60 days for you as soon as possible.